This summer -- like every other one -- I go back to school. I don't need remedial help. I'm not taking accelerated classes. It's just that -- on two or three Saturdays every summer -- I'm enlisted to give tours of Staples High for reunion classes. It's not that they're so old they forget what the school looked like. It's that -- since the new building was constructed nearly a decade ago, and the old one demolished -- the school they attended exists now only in their memories (and yearbooks). Well, not always. I've given tours to classes that graduated before 1959. Their Staples was the original, on Riverside Avenue. 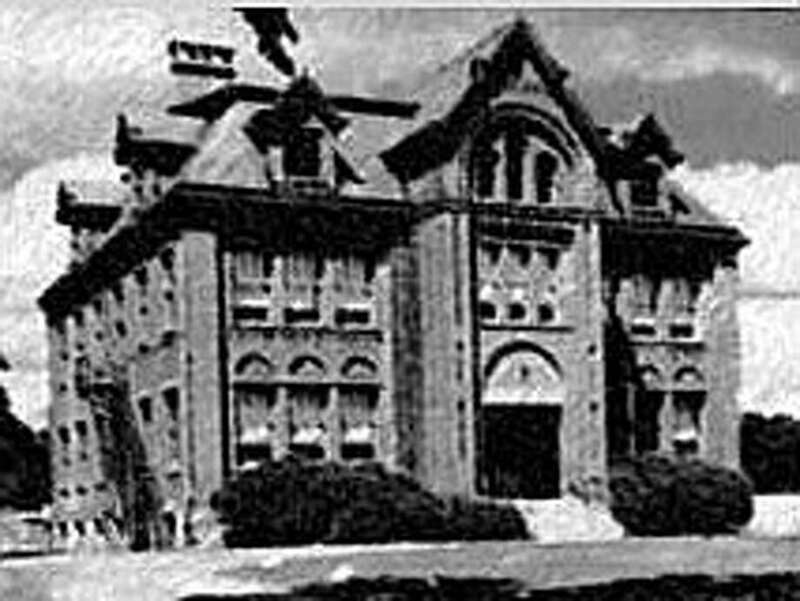 (It's now Saugatuck Elementary School, after incarnations as Bedford Junior High and Bedford Middle School.) To them, 70 North Ave. will always be the "new" campus -- even if the "new" Staples was built, added on to, modernized and finally torn down, all in the half-century since they left. Whatever their ages -- spry octogenarians or hungover 30somethings -- the tours are basically the same. There are graduates, spouses, an occasional hanger-on. They tell stories about past classes, activities and pranks. They ask questions about teachers: "Is Mr. So-and-So still teaching? Or alive?" I start the tour at the front door. I note that the old building on North Avenue never had one. There were hundreds of doors, but no main entrance. Inevitably, that leads to stories about how easy it once was to sneak out of school (and the joys of open campus). I point out the impressive tiled school seal in the entryway, and mention that for some reason it says "1885." Staples was founded in 1884; the first graduating class was 1886. It's interesting that graduates from the 1950s attended a school that was even older then than they are now removed from it. We climb the stairs to the second floor. That's new -- the previous Staples consisted of six (expanded to nine) low-slung buildings, sprawled across campus. At first they were connected only by open-air walkways; between 1978 and '81 they were enclosed, in a modernization project of spectacularly shabby construction. On the second floor I show them things they never dreamed of: A dedicated suite of offices for Inklings, the school newspaper. A wide "bridge" where students gather to work collaboratively on projects, using laptops and tablets. The language labs, generations removed from reel-to-reel and cassette tapes. (Heads nod approvingly as I describe the enormous number of students taking ancient Latin and modern Mandarin.) Flat-screen TVs, which eliminate the age-old complaint about a lack of communication in the school. On the third floor I point out the greenhouse (in classes from the mid-'60s onward, someone inevitably mentions marijuana being grown in the previous, smaller one). We slip into a modern science room, complete with smartboard. I describe the robust science curriculum -- including Advanced Placement Environmental Studies and a three-year Authentic Science Research program, which has produced an international Intel contest winner -- and talk about the innovative math program, which draws from (and contributes to) research being done in cutting-edge places like Singapore and Finland. I talk about the high numbers of female math and science teachers, and the impact that's had on the number of girls who take -- and thrive in -- those courses. Back downstairs, we tour the arts and music wing. Alums become emotional as they talk about the impact the arts made on their lives. The choral room remains the same -- it's one of the few things that has not physically changed -- but the new Black Box Theatre is a huge hit. As I describe the innovative staging of productions there -- "The Laramie Project," "The Diary of Anne Frank," "Twelve Angry Men" -- I see the awe in graduates' eyes. They are blown away by the TV, radio and audio production studios, even more so when I describe the work that goes into the thrice-weekly "Good Morning Staples" television shows. The culinary kitchens -- and my description of the international foods curriculum, complete with a focus on sustainable agriculture -- draw similar gasps. There are laments at the demise of vocational education -- a national issue. As the tour wends its way to the library, someone inevitably remarks, "This is the first time I've ever been in the Staples library!" We end up in the auditorium lobby. Graduates are thrilled that this vital part of the school finally has been tied , architecturally, to the rest of the building. It is, truly, the heart of the place. As the tour ends, alumni always say the same things. They talk about how beautiful the building is, and how well it works. But they also kind of liked having all those outside doors they could sneak out of. Dan Woog is a Westport writer, and his "Woog's World" appears each Friday. He can be reached at dwoog@optonline.net. His personal blog is www.danwoog06880.